The Best of Yukon 2020! Have you ever visited a location and say have I seen it all? Or when somebody is having a conversation about a place you have travelled, and they mention something spectacular about an area you did not get to visit while there. Do you get upset, contemplating that you may have missed out on seeing a beautiful part of the region or do you possibly think, now I have to go back to see this? This is the most complete trip anyone offers to the Yukon, as I would love my clients to see it all. This trip will fill your portfolio with images and moments that you will be sharing for a lifetime. From flying over glaciers, driving through mountain ranges, watching the aurora dance over the dark night sky and photographing the abundance of wildlife, this trip encompasses it all! We will focus on planning for a successful landscape, mountain ranges, aurora borealis, and wildlife photographs. Learning how to use proper composition and natural objects to help create impactful “keeper” photos. Techniques such as long exposures, HDR and light painting will all be part of our daily activities. Black and white fine art techniques are also available to learn if interested. When we are out photographing we will discuss camera settings, holding your camera properly, how to set up a tripod in different terrain, how to care for your gear and what it means to think outside of the box. Our goal is to take your photography to the next step and help you achieve your photography to the next level of learning. When we return to the hotel some nights, we will then open up our laptops and discuss editing techniques to achieve sharper images, how to manipulate color, create better composition from cropping and introduce you to some techniques we use to create more appealing images. Most of all we want you to have fun and enjoy your vacation. Day One Events: Today you will be flying into Dawson City, a location that many people have on their bucket list to visit. This small little town nestled in the mountains offers a wide range of photographic opportunities for your camera. If I could attempt to paint a picture for you; Dawson City is alive with its old historical mining town roots, however over the years it has grown to have quite a few modern amenities. As you wander down the streets of town, you will perhaps notice that the roads are nothing but gravel here, and that rustic plank wood sidewalks still line the bustling streets, almost as if you have taken a step backwards through time into the gold rush era. Many hotels and old saloons have been restored over the years, however they have been well preserved to keep their historical look. As this location is well known for its history in the Klondike Gold Rush! Once you arrive, you can get situated and freshen up in your room. We will then go over a briefing, on what is to be expected on this trip and what types of locations we will be in. Many people have no idea the landscape diversity that Yukon offers. On this trip you will view them all, from snow peaked mountains, barren desert like mountains, large rolling hills, boreal forest, tundra and grassy meadows. After all our introductions and everyone is ready, we will go play in the town of Dawson. Photographing the old buildings, riverside landscapes and possibly a quick drive to see some of the most active gold mining areas around town. We will then head back to our hotel and go out for a dinner. And afterwards, if anyone feels bold and daring we can stop into a famous bar for a time-honoured tradition in Dawson City. The Sourtoe Cocktail! Weather depending we will go out and to photograph the aurora dancing across the sky, to make a memorable first impression of your trip. Day Two Events: It will be an early day for us, as we have lots of ground to cover, so much to see so little time. 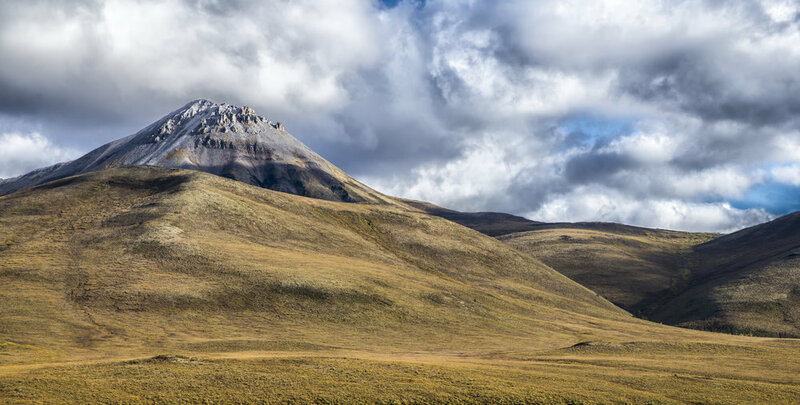 Today our destination is the Dempster Highway, a location where I have captured some of my favourite images. As we travel along the highway, we will be stopping to photograph iconic locations that I believe best represent Yukon and all its glory. 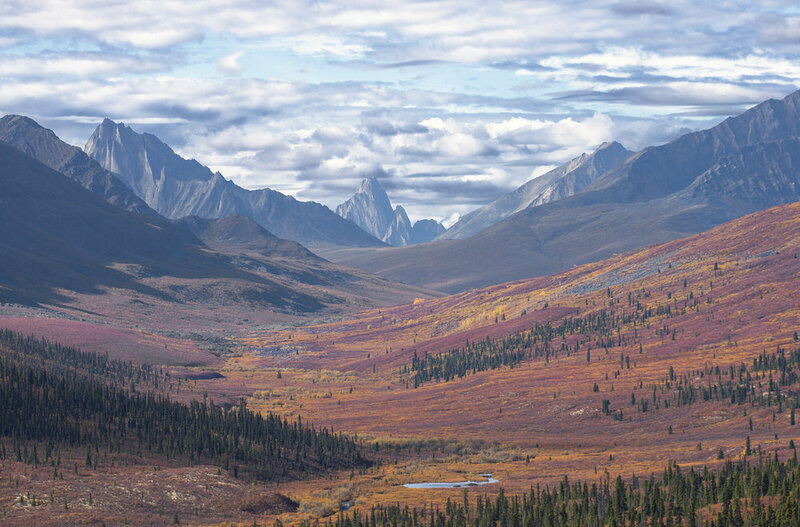 Our first stop will be the Tombstone Territorial Park. A location that can have it all, wildflowers, wildlife, and most of all wild mountains. 😜Here we will spend some time working on composition, so that you can capture this location at its ravishing best. Some quick hints: take your time, shoot wide, shoot tight, take some panoramic images, or do a time-lapse. This is a great location to experiment with your camera and lenses! Once we are finished we will start our journey down the highway again. But, to be completely honest, we probably will not get to far before someone speaks up requesting to stop, so that they can take another shot of something that has caught their photographic eye. Trust me, this whole trip all I expect to hear from everyone in the backseat is, "Can we stop? I would love a photograph of this!" Believe it or not, I actually relish in this, it means that you are seeing the beauty in Yukon just as I do. The Dempster Highway is one of my favourite locations to see wildlife along the road side. The more eyes we have scanning the roadside, as we travel, the better the odds are of spotting something. 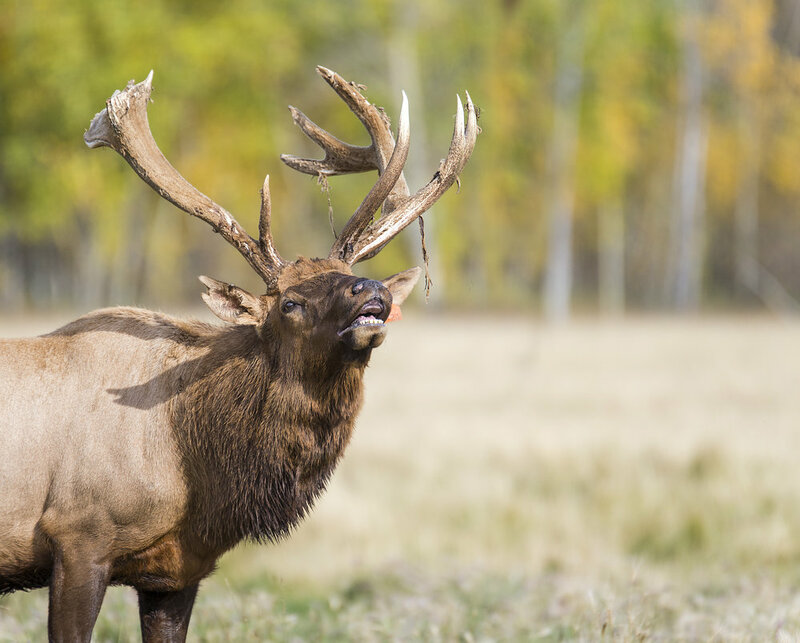 In past trips, we have photographed: a grizzly bear and cubs, a black bear and cubs, moose, caribou, mule deer, porcupine, foxes, coyotes, hares and many types of birds. Our destination today is Eagle Plaines. This location is the only stop in Yukon along the Dempster Highway. Its one stop shopping here; a restaurant, gas station and hotel, all in one location. We will drop our bags in our rooms and have something to eat in the restaurant. Afterwards, I have a little treat for you! It is definitely an amazing photographic opportunity. I have thought about keeping it a secret, but... I guess I could perhaps share it will you now. Just north of Eagle Plaines is the Arctic Circle! This will be our destination for this evening. You will all have a chance to stand with the Arctic Circle Sign, and have your photo taken. As a keepsake or proof that you have been to what a Canadian calls the true North. Afterwards, we will go back to the hotel and rest up so we can go out and shoot the aurora tonight. Day Three Events: This morning we will be getting up to look for wildlife, this area has always rewarded photographers. With images of some of the largest animals Yukon has to offer. Momma bears and cubs are a frequent sight, around these majestic locations. These mountain ranges are also, known to hold many fall wildflowers and berries in the area. The winding rivers of the area, offer a food source of fish and crustaceans to many species. Along the way, we will stop and photograph some of the areas of Yukon that have tugged on my heart strings each and every time I visit. Some of these amazing mountain ranges are known to hold up to fifty-five percent of the worlds tungsten reserves. Not to mention, the plethora of gold that has been found in 'them' mountains. 😉 As we, meander back to our destination, take note to view the differences of each mountain range. They all have their unique characteristics, varying from one to the next, which can completely change the landscape. No matter how many times I make the drive through these mountain ranges, it always sticks out to my eyes, I find it quite raw and beautiful each time. Our destination will be to overnight in Dawson City. Once we get into town we will stop for dinner and have a rest from our big day of photographing the mountains of Northern Yukon. If the weather is good, we will be heading out to photograph Lady Aurora, in a destination that has always provided great aurora photos with beautiful mountain backdrops. Day Four Events: We are on the move today, this time we are starting to drive south. You will notice, as we move away from the towering mountain ranges, that areas of rolling hills and colourful birch and aspen stands begin to appear. 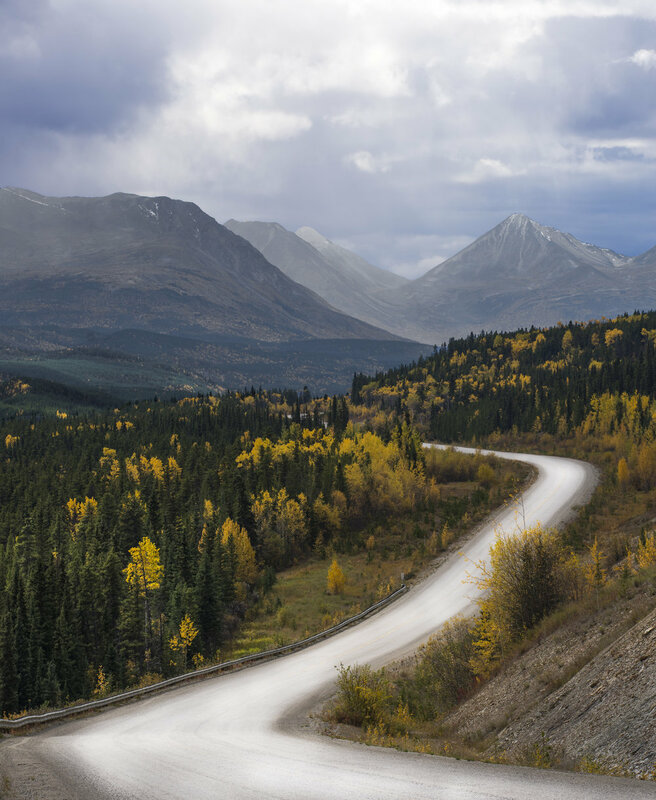 We will of course be stopping along the way, to stretch our legs while photographing some stunning Yukon landscapes and possibly even some roadside wildlife. Just remember at anytime in Yukon wildlife can be seen. With all the tourists gone for the season, the roadways are very quiet so animals are less scared and more active here. Moose, at this time of the year are very unpredictable due to the rut season. Every week I have found a moose or five, along the highways is always during rut season. 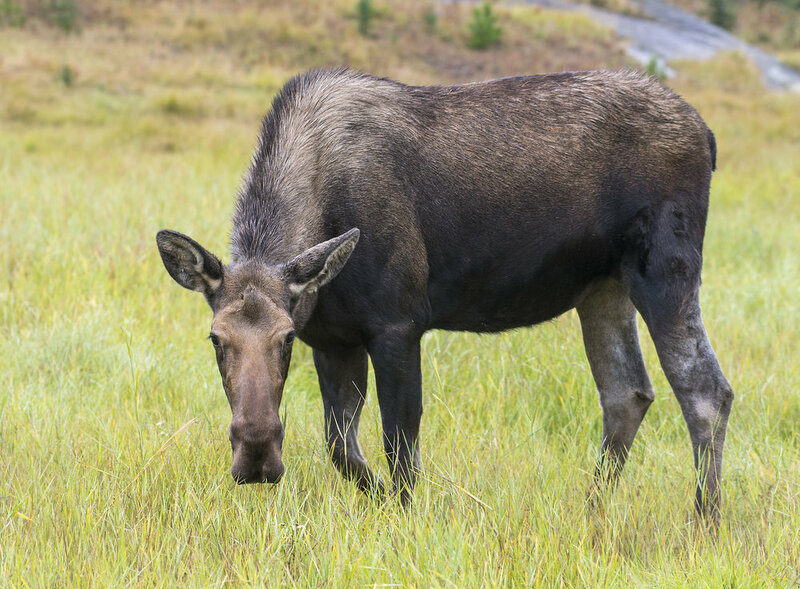 In the off season, moose tend to hide or stay at higher elevation just like the caribou. This helps them to avoid the bugs in the bushes and around the marsh like areas. There will definitely be two stops on this trip, one will be to stop and have a great lunch and the other is to buy one of the worlds largest cinnamon buns and a coffee. Our final destination will be Whitehorse, the capital of Yukon. You might be surprised that it is not larger, seeing as it is the capital city, however it has all the amenities the locals need. I will take you on a short tour around the town, teaching you all about the history of Whitehorse and how it became the Yukons' capital. After, we will check into our hotel and head out for dinner. Tonight we will try and catch a sunset over one of my favourite lakes surrounded by mountains. Almost every time I have been here, the clouds go a beautiful enchanting pink colour and the fog looks like something out of fairytale rolling down the mountain side. After our shoot we will head back to the hotel, for some editing in a private room or so you can grab a bit of rest before heading out to photograph the aurora in one of my favourite locations in Yukon. Day Five Events: After a healthy breakfast or a bacon feast, we will head out to see some of the best locations southern Yukon has to offer. We will explore this area throughly, from pristine clear waters, snow peaked mountains, fall colours and possibly encounter some great wildlife along the way. One can only hope for a clear windless days, as many of these locations offer pristine reflections, which I find adds an amazing impact to photographs. Today you are about to do something I only offer on my "Best of Yukon" workshop. I have arranged to have a private photoshoot with local First Nations in an old village. We will have the chance to use natural light and position him how ever we please to make the most complimenting photographs. Day Six Events: Pack up your bags we are heading West! After breakfast we will be moving to our next location of the trip, Haines Junction. This location always rewards me with some of the most memorable moments, best photographs, and beautiful sunrises. Not to mention we are right in the heart of grizzly bear and black bear country. As we drive to photograph some of the most amazing glacier fed lakes, keep your eyes peeled for bears along the rivers and berry bushes. Today we are in a good place to work on some long exposures, moving clouds, rushing rivers, and glass like reflections on sheltered lakes. After our day in the mountains we will head back to our hotel and grab a bite to eat. Tonight we have 3 different locations that offer great reflections for aurora photography over a lake. Lets hope for another night of possible great aurora shooting! Day Seven Events: This morning we will be heading out to a location not to far from our hotel. Today we will see Kluane from above. A spectacular 75 minute flight deep in the heart of Kluane. Many of Canada’s highest peaks are here, in the breathtaking St.Elias Mountains. Amongst these giants, Mount Logan rises to 19,545 feet above sea level (5959 meters). It is surrounded by the world’s largest non-polar ice-fields. When we are not flying over all this northern beauty, we will be visiting many of the area lakes that are framed by the Elias Mountain Range. We will be taking reflection photos and working with our filters to create stunning reflections on the glacier fed lakes. If the aurora is out and the skies are clear, we will head out to one of our locations to photograph the aurora over one of the secluded lakes north of Haines at Kluane Lake or Destruction Bay. Day Eight Events: Its an early start to the day for us, breakfast and we are out the door. This morning we will be heading to some low lying areas to find some fog that the sun is trying to burn off. These valleys can make some surreal images with small pine trees in the foreground with large snow covered mountains in the background. Once we can cut through the fog we will head back to Whitehorse. Our last stop of the trip will be a moment to relax, we will be heading to Takhini Hot Springs. Here we will relax and let our bodies re-charge before heading back home. If you wish to opt out of the hot springs you are welcome to relax in the cafe and enjoy a good ol'cup of Joe or a lovely herbal tea. After we have re-charged it is off to the Whitehorse airport. Please have your flight booked 5pm or later out of Whitehorse. 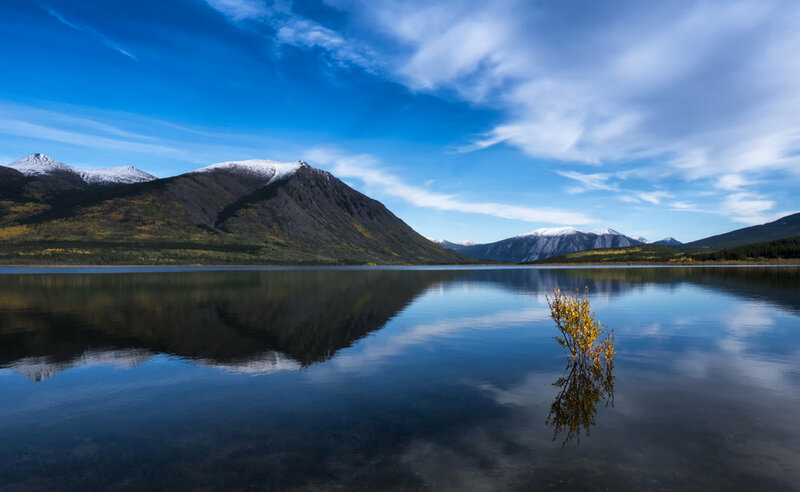 Ready to photograph all the amazing beauty that is Yukon, click the button below!